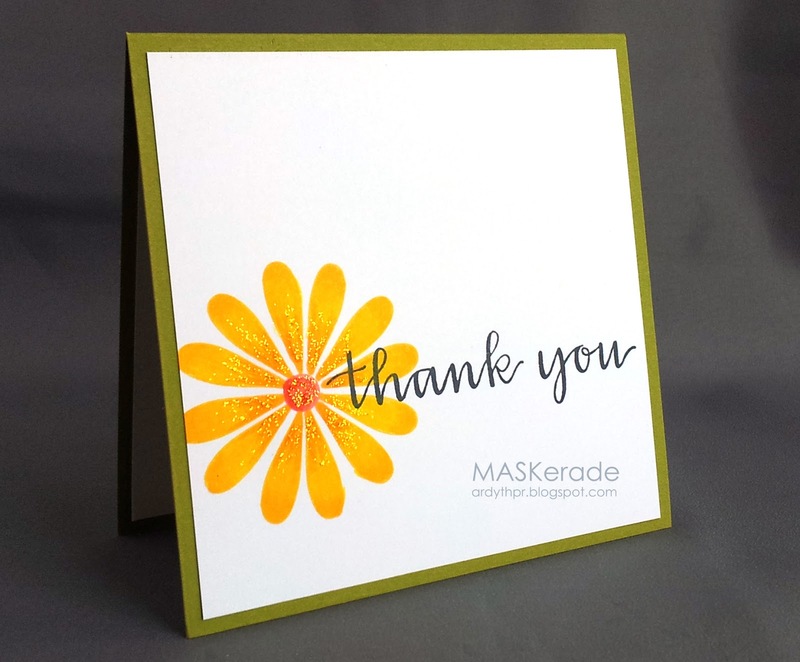 MASKerade: Muse 49 - Thank you! Muse 49 - Thank you! Ah! I feel warmer already! This polar vortex has resulted in cold winter temperatures that have forced me to stay inside a lot this week, but Laurie's sunny Muse cheered me right up. Great fresh colours and a lovely message, too! I focused on the shapes and colours that Laurie used. The flower is from Impress and the sentiment is from EMDash. I gave the flower a little 'dimension' by shading the petals with copic markers. It's an easy way to give your simply-stamped images a bit more interest! There is still time for you to play along with us - the deadline is Monday morning at 8:00 am EST. Then you can vote until Tuesday morning, and the winners will be announced on Tuesday at noon. Oh my goodness...I am in love with how cheery this card is Ardyth! Sparkly sunshine - perfect for these cold wintry days! Fabulous and cheery! I love the way Laurie's card inspired you Ardyth! Wishing you a fabulous creative 2014! 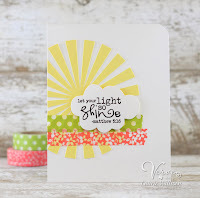 Great idea to shade your stamped image, I never think of that! Thanks for the tip!! Thank goodness this storm is over. What a happy card! I love the colors of the flower. What a wonderful take on the current Muse inspiration...just love it! Only thing sunnier than the sun itself is a sunny flower. I love the dimension the Copics make on the petals. Gorgeous cheery card, Ardyth! No wonder it's made you feel warmer :) Love the added dimension from the shading and Stickles. I'm finally getting a chance to catch up on my visiting and blogger is erasing and giving me an error message on every other blog! Aacckk! And it doesn't matter what operating system I use. So, Ardy, I hope you don't mind that I am just going to say that I have caught up with each post I've missed and tell you in this one comment box how much I love each and every one! You'd think, after a while, that you might hit a sour note, but nope, each creation is more brilliant and creative than the last one!! You WOW me every single time!! Fabulous! I love the flower with the shading and sparkle! Your card is like a burst of sunshine. I love the bit of sparkle on the petals, and how your sentiment overlaps with the flower. ...giggled at Darnell's comment...we have all come to expect perfection at every visit...and we are NEVER disappointed! The green card base - stunning! I'm quite sure that 9.9/10 of us would have reached for yellow or orange! Beautiful shading of the petals! Love the sentiment stamp! CAS cards are always striking, and yours is just so. I love the large sentiment placed over your flower as well as the hint of glitter :)Great job! What a great thank you card. Clean and beautiful. Gorgeous! Love the shading and glitter on your sweet flower.